Mothman wrote: Yes... at least I thought so. He talked about that LB issue for years when it was definitely a hot spot that needed to be addressed but it's possible he was only referring to this past draft. However, he made it clear in his initial post that his frustration extended beyond this year. Shoot, a person can miss a lot in a day and a half. I was just throwing out examples of what the Vikings have done in the past. Been a fan since '69/'70. I've seen so much squandered. 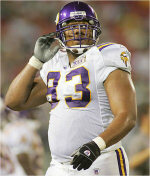 Years meld into one another over the years and the Vikings have underachieved in the draft many times. And yes, there was a much more glaring need on BOTH lines compared to wr. PHP, the way you have defended Treadwell one would think that you think we are set at wr and would be focused on the lines. And even though positions have been addressed recently it is barely enough in my book. Drafting 12 wr's in Ricks tenure leads me to believe two things, the evaluators that give Rick his info have severely underachieved and Rick has trusted them. Part of replacing a guy like Clemmings is developing future talent. So if they send him to the wind, they are not just looking for a quality back up, they are also looking for a future contributor. So the question Rick has to answer isn't whether to cut Clemmings, but WHO is available that would provide not just better services today, but more upside down the road. I suspect that if such a guy existed they would have gladly made the move. This isn't to say the TJ Clemmings has tremendous upside, but you do not see a lot of NFL rosters carrying veteran backup at Tackle. Not like you do QB or RB. Also, it is worth considering the odds of having a season where both Tackles go down like they did for the Vikings. Actually, last year they had three go down if you count Jake Long. I suspect that this series of events is exceptionally rare. Obviously, the Vikings didn't do themselves any favors by relying on two guys with extensive injury history in Kalil and Long. (And a 3rd guy who was washed out of CIN.) But the players they have now do not have the same history of injury liability, so IMO, the odds of seeing extensive backup play, at least to the extent we saw it last year, is probably low.